Cinema 4D has gained a quiet following among 3D professionals, especially those who composite 3D design work with photography and video. 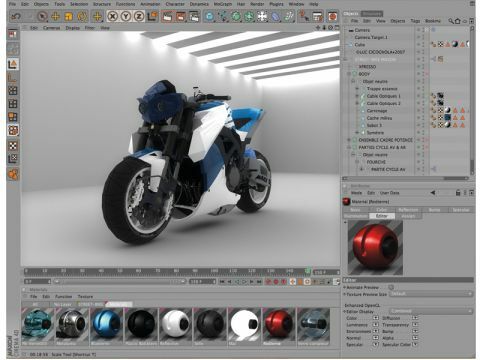 More of a destroyer or corvette to Autodesk's two dreadnoughts, it's smaller and simpler, which makes it easier to learn and also to work with. Output quality is just a minor notch down from the high end, but if you're not a 3D professional you probably won't notice – it's still very good indeed. HDR support means that high quality photorealism isn't too difficult to achieve – some of the gallery shots on the Maxon website show off what's possible, and it's worth taking a look to see if you can tell where 3D ends and photography begins. Render times are also relatively speedy, and at extra cost you can build your own mini-render farm for professional production speeds. Cinema 4D hits a sweet spot between a high end monster you'll need a second mortgage for, and a low end toy. The balance between productivity and price is hard to beat.